Overhanging rock over the Drimneen River once forming part of a continuous cavern through which the river flowed. Extract from article “Observations made during a visit to Connemara and Joyce’s Country, Ireland, in August 1835” by Charles C. Babington found in The Magazine of Natural History or Journal of Zoology, Botany, Mineralogy, Geology and Meteorology Volume 9. From Galway we proceeded nearly due north-west through a rather flat, and far from interesting country, which, however, became gradually more and more hilly as we approached Oughterard; and, although for the most part totally devoid of trees, it was plain, from the excellence of their growth near to several gentlemen’s seats, that the climate and soil were not the causes of their deficiency. On both sides of the road the country consists wholly of low rocky hills and bog, but several views are obtained of that extensive sheet of water denominated Lough Corrib. This lake is more than thirty miles in length, extending from the centre of the Ma’am Turk Mountains to within a few miles of Galway; and is about eight miles in width between Oughterard and Cong. The gilaroo trout is found in it; a fish celebrated for having a strong muscular stomach, resembling the gizzard of birds. It is generally considered to be a variety of the common secies (Sálmo Fário). At about three miles before reaching Oughterard, the road is carried over a natural bridge formed of carboniferous limestone. 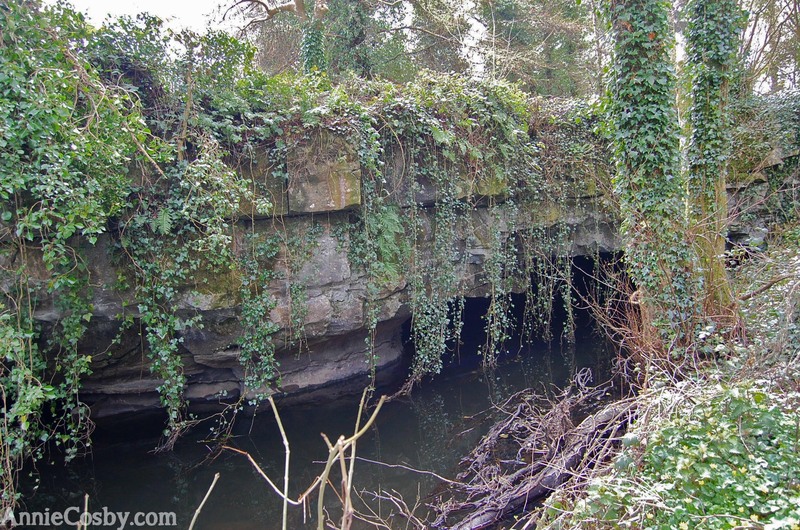 By following the stream from this spot, for rather more than a mile, the geologist will be gratified by seeing a most curious seccession of natural arches, apparently forming part of a once continuous cavern through which the river flowed. The fields on both sides of the stream, judging from the abrupt depressions of the surface which occur in many places, are probably supported by a succession of similar caverns. This singular structure appears to terminate at a point which is wel marked by a fine old castellated tower in pretty good preservation. This building is very interesting from its architecture, but still more so from its situation, being built over the river, upon the last and loftiest of these natural arches. Judging from the state of some of its outworks, it appears not improbable that this castle was built before the surface of the land near to it had sunk in the manner described above. The river must then have been quite hidden, and the site of the castle have appeared as a slight elevation in a flat country. At a short distance beyond the natural bridge, and close to the road, a small quarry of black marble is worked in the carboniferous limestone. Oughterard is pleasantly situated near the shore of Lough Corrib, upon a small river, which, just above the town, is broken by a succession of rapids nearly approaching in character to a waterfall. Near the centre of the town stands a new and handsome Roman Catholic chapel, just below which the upper bank of the river has a highly interesting structure, the limestone of which it is formed presenting the appearance of half an elliptical arch over the water, of which the other part has been destroyed by the action of the stream. Here the Daboe’cia polifólia (Menziésia polifólia) first shows itself in its full beauty, ornamenting every dry rocky spot of ground with its large elegant flowers and conspicuous foliage. It may be as well to observe, once for all, that this plant first appears at the distance of a few miles to the east of Oughterard, in very small quantity, but is plantiful throughout all the country to the west of that place, as far as the Atlantic. In the neighbourhood of Oughterard, the banks of Lough Corrib are quite devoid of grandeur, being bounded by a vast extent of bog, out of which rise a few low rocky hills, partially cultivated: still, an expanse of water, eight miles in width, and studded with numerous small islands, can never be totally without interest. The shore of the lake, and its islands, consist of carboniferous limestone, having a very bituminous odour. The upper part of this stratum is full of organic remains, such as Euómphalus O’strea, encrinites, and corallines. Good specimens of most of them may be obtained by the road side, near to a house belonging to Mr. Martin of Ballinahinch, and commonly denominated his “gate-house,” being the point where the road enters his property. No traveller, who is interested in architectural remains, should leave Oughterard without visiting the ruins if the old church, in which are several windows of forms which I have never before noticed. Not being skilled in architecture, I am unable to describe them, but may add that they have great similarity to several which occur in the old castle noticed above. It may be as well to observe, that Connemara is considered to begin at Oughterard, that town not forming part of it. This page was added on 02/05/2013.